While it looks like we may be getting an official Doctor Who Lego set later this year, in all likelihood, it will be based off the current series. Which is fine, especially if it in any way compares to this absolutely glorious reproduction of Matt Smith's console room that somebody recently came up with. But some of us grew up with the classic series, and by golly, we miss the round things... even if we have no idea what they were for. 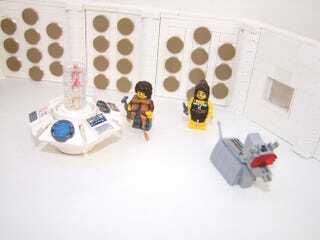 Well, for those of you who are interested, I not only built this reproduction of the classic 15th-20th season console room, using all commercially available parts (except the scarf), I've also put it up on the Lego Ideas site and have included some instructions for building your own. Who knows if it will ever make it to the full 10,000 votes to be approved, but hey, I'm 1/1000th of the way there on my first day. It pays to be optimistic. Did I also mention it comes with Lego versions of K9 and Leela, plus a scale sized Bessie? Because it does. Since I've still got a crapload of white parts leftover, my next design will probably involve trying to recreate the 3rd Doctor's Whomobile. After that, I'm not sure. Possibly the giant version of the Kettlewell robot from Robot. It's one of the few designs I can scale up to just about any size I want. Plus, I've already got Bessie and a bucket, so that's half the tableau complete.